Bruges, a town in Flanders, is in the northern part of Belgium and is a historic capital of West Flanders which is one of the three regions of Belgium. With its compact size, it is relatively cosmopolitan and bourgeois and is one of the best preserved pre motorised cities in Europe offering all types of charms which are very rare to find anywhere. French with a little bit of German around the country since it is positioned between the Germanic and the Latin countries. This has placed Belgium in the centre of both European commerce as well as battle over commerce for many years. Bruges had used its location to a very great extent in the early years in the 13th to the 16th centuries in building wealth trading in wool textiles, spices wine and grain. The industrial of Bruges grew in banking helping in improving the development of the Flemish region while the northern Wallonia remained more pastoral and agricultural. Its historic division between the two main regions still influences the Belgian economy till date. Bruges operated as a major hub of shipping and trade till the Zwin channel got filled with silt towards the 16th century causing limitation to access to the sea and the decline in trade affected Bruges to a great extent while the nearby Antwerp benefited from Bruges set back. After almost two hundred years Bruges managed to rebuild its industrial structures and reclaimed its capacity for large ships and got recognised as a tourist centre during that time. The historical centre is not too big and has been beautifully preserved;with most of its attractions are in close proximity and hencecan be explored on foot. The only mode of transport within the city is the public buses which are operated by the Flemish public transport company, De Lijn. Taxis in the market place and the station cost around € 10 and bicycles can be rented to move around the city with speed though the cobblestone path makes the rides a bit uncomfortable and bumpy. Belgium has three airports; the local airport for Bruges is Ostend/Bruges International Airport-OST with Ostend being 30 km from Bruges with availability of plenty of car rental services. It is also Belgium’s chief tourist attraction and has become a major tourist city and an industrial port. It has been nicknamed as The Venice of the North, due to its many canals and the proximity to the waterways. 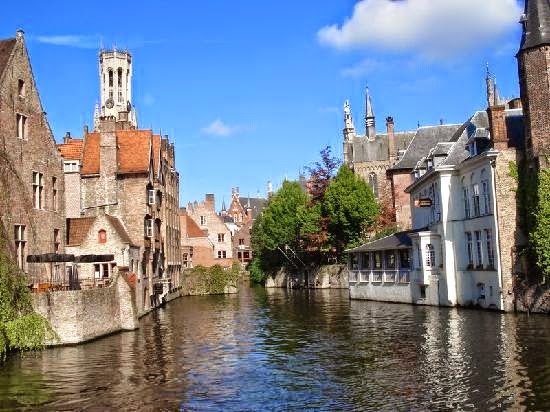 Bruges has a population of about 117,000 and in the entire metropolitan area around 250,000. Bruges was designated in 2002 as European Capital of Culture and its well preserved historic centre is filled with medieval art and architecture.